This could one day allow us to create synthetic life forms founded upon a reverse biochemistry. 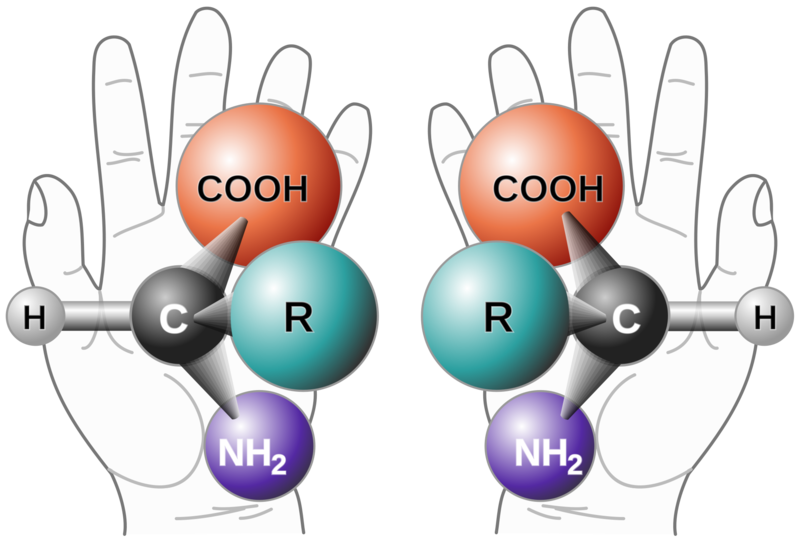 One of the great mysteries of life concerns what is called life’s “chirality”—that is, its “handedness.” Just like you and I, the very macromolecules that make up our cells exhibit “left-handed” or “right-handed” tendencies; it’s strange and maybe counterintuitive, but a molecule of a certain chirality is incompatible with its mirror-image complement, like a right-handed and left-handed glove. In the case of terrestrial life, amino acids are always left-handed, and DNA twists in a clockwise fashion. Who knows why—perhaps it was merely chance, or perhaps the weak nuclear force governing subatomic particles, which also exhibits “handedness,” tipped the balance just enough in the early days of evolution to fossilize the present chirality preferences into life. But now a group of researchers at the Tsinghua University in Beijing, China, have taken what’s being described as a “small step” toward the creation of mirror-image organisms—they managed to synthesize a polymerase enzyme that can copy DNA and render it into RNA. It means the possibility of generating synthetic life forms founded upon a reverse biochemistry and capable of self-replication. Aside from its superficial resemblance to a “mad scientist” scheme, the creation of a functioning mirror-image biochemistry has many important practical implications. For example, enzymes and other biomolecules of opposite chirality could be synthesized for medical purposes—they might be immune to attack by viruses or resistant to the biochemistry of ordinary bacteria. What the Tsinghua team did was to create a “stripped-down” version of a mirror-image polymerase—an enzyme that usually has more than 600 amino acids—by creating a mirror-image of the smallest polymerase known, “African swine fever virus polymerase X.” With only 174 amino acids, it was simpler to synthesize the right-handed amino acids and assemble them into a functioning enzyme. Granted, the polymerase is slow, but it did its job well. It managed to spin a 12-nucleotide template into an 18-nucleotide left-handed DNA strand in four hours; after 36 hours, it had assembled a 56-nucleotide strand. And they even got this “Bizarro” polymerase to transcribe the mirror DNA into mirror RNA—an important step toward building a functioning organism. Building a mirror-image ribosome would be no easy feat, though, so don’t look for weird, mirror-image birds and dogs and people to start appearing anytime soon.